In the foothills of the northernmost Green Mountains, just 16 miles from Vermont's Canadian border, the village of Enosburg Falls proclaims itself "Dairy Center of the World." One recent addition is a Vermont historical site marker commemorating the birthplace of Larry Gardner. A Civil War hero? An innovator of farming techniques? Hardly. Long considered the greatest baseball player to come out of Vermont, Gardner was the regular third baseman on four World Series championship teams, the Boston Red Sox of 1912, 1915 and 1916. In 1905, Larry Gardner rose to what stardom a small town near the Canadian border could offer. He played baseball. Larry tossed his fifth shutout in seven games against Newport High School on May 27. More than two weeks later he closed the season with a 10-1 win over Newport, which "would have been a shutout, but for a wild throw in the first which let in Newport's only run." The team's 7-1 record, according to the Enosburg Standard, clinched the high school championship of Vermont. Larry went on to be the star shortstop of UVM, batting .400 in 1907. During the course of UVM's 1908 season, Larry received several offers by telegram from John Taylor, president of the Boston Americans (at that point just starting to be called the "Red Sox"). After his senior year final examinations, he reported directly to St. Louis, where the Red Sox were in the midst of a western road trip. Larry remembered feeling "like a lost kid from the green hills" that summer. "Before this time I'd never seen a big league game," he said. "I'd been to the city a few times and while there held on to the hand of an older person for fear of getting lost." In his first official major league game, Larry replaced an injured Harry Lord in extra innings and ripped a game-winning double to beat the Washington Senators at Boston's Huntington Avenue Grounds. During the 1912 season Gardner and his best friend on the Red Sox, Harry Hooper, lived together in Winthrop on Boston's North Shore. During mornings the two players viewed the bay and took dips in the salt water before driving to brand new Fenway Park in their four-cylinder Stutz roadster, which they co-owned. They cooked shellfish by digging a hole in the sand, throwing in hot rocks and covering the hole with seaweed. That 1912 season was a breakthrough year for both the Red Sox and Larry Gardner. Boston ran away with the American League, besting second-place Washington by 14 games, and Gardner hit .315 with a team-leading 18 triples. Larry Gardner was on top of the world that winter. He was named the first-team third baseman on Baseball Magazine's All-America team, the first of four such selections he earned over the course of his career. Then he signed a three-year contract with the Red Sox. Still Larry remained his same humble self. “He has a disposition as sweet as the wild flowers that grow on the mountains of Vermont,” wrote Tim Murnane. On July 11, 1914, Larry Gardner collected three hits to make a winner of a rookie southpaw in his first big-league pitching appearance – a young man by the name of George Herman Ruth. After hitting .259 and a career low .258 in the previous two seasons, Larry rebounded in 1916 to hit .308 despite playing with a dislocated big toe. His batting average was fifth best in the American League, behind only Tris Speaker, Ty Cobb, Shoeless Joe Jackson, and Amos Strunk. With Speaker gone to Cleveland, Gardner became the biggest bat in Boston’s lineup as the Red Sox won their second consecutive AL pennant. Then he enhanced his reputation as a clutch player by smashing two home runs in the 1916 World Series against the Brooklyn Robins. Despite his heroics, Larry couldn’t get a raise. The most Red Sox owner Harry Frazee offered was to bring Larry’s new bride, the former Margaret Fourney of Canton, Ohio, to spring training at Hot Springs, Arkansas, as the club’s guest. “I told my wife to take 40 baths a day and ride horses the rest of the time,” Larry said. “We really stuck Harry on that one!” In 1917 his batting average fell from .308 to .265, giving the Red Sox an idea that he was slipping after 10 years of service. 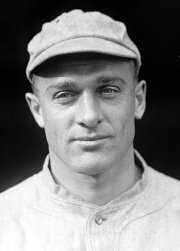 On March 1, 1918, Boston traded Gardner, reserve outfielder Tillie Walker, and backup catcher Hick Cady to the Philadelphia Athletics for first baseman Stuffy McInnis. Larry Gardner was baseball coach for UVM and later named UVM's athletic director in 1942, and he held both positions until his retirement from the university in 1952.